This is the perfect bowl shaped garden planter to set next to a pool. The low bowl shape will not block the view and the plant materials are great for their long lasting appeal and ability to fare well in the summer heat. 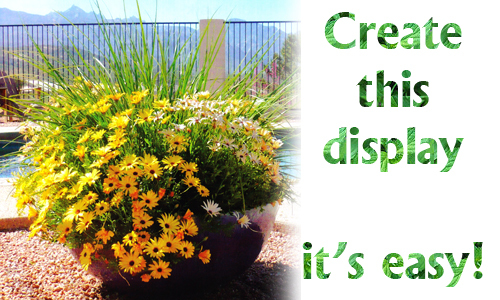 If you like this potted planter, we can show you how to duplicate it! First get a nice sized container to plant in. Make sure that it has a drain hole for good drainage. Then fill with potting mix that has a fertilizer mixed into it. 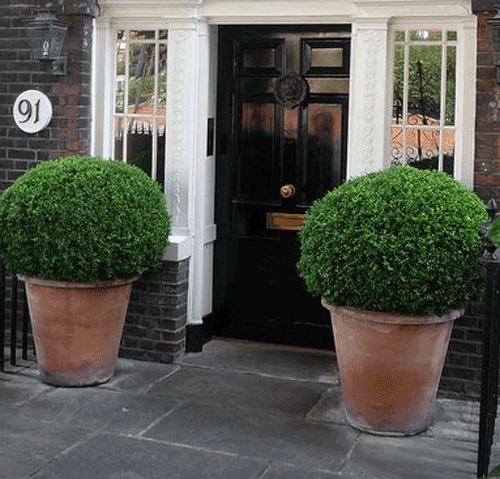 We like the look of a high shine glazed pot for this type of planting materials. 1. Lemon Symphony African Daisy (Osteospermum 'Seikilrem', annual is bright, colorful and durable. 2. Sunny Serena African Daisy (Osteospermum 'Sunny Serena', annual has small buds that are bright with hardy greens that are lush. 3. Butterfly iris (Dietes grandiflora) Nice and spiky adding a bit of texture and height to the arrangement without blocking the view. 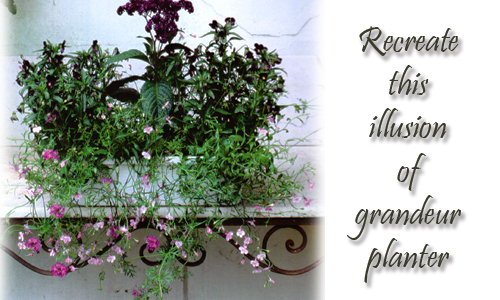 Try these plants and potting container and create a lovely display like the one show above. Be sure and let us know how it worked for you. Read more.....7 water loving plants for pots. Read more.....Steps ot improve your indoor gardening skills. What you do to your own plot of land affects the larger landscape around you. Your neighbors, as well as nearby meadows, deserts, forests, rivers and other waters. How well are you doing? When it comes to design does your garden space utilize paving, like gravel, granite or pavers' with spaces between for ground cover? If your garden and pottery containers watered by a drip system that includes an automatic controller? Do you reprogram the controller to fit the demands of each season? Like less water in winter and more in summer? How about do you group plants in your containers according to their water needs. This is so important for the plants health and making sure you are not over watering the planter where it will flow outside the pot into the soil from the pots drain hole. Finally, does your garden or patio area feed and shelter birds, butterflies, and other wildlife? Come on people do your part. These poor creatures have enough to deal with already and can use all of our helps. We sell birdhouses and feeders that are inexpensive, cute and do the job! Check them out.....Have you planted flowers or plants in your garden pottery that attracts beneficial insects like lady bugs and lacewings, to help control harmful insects? And finally, have you planted perennials such as lavender, or salvia that attract pollinators like bees and hummingbirds? These are all easy steps to take to insure that you are doing your part to help the wildlife, conserve your water and increase the success of your plant materials life. It's really very simple. Read more.....Nobody makes custom pottery. Read more.....Stop animals from nibbling. It's really easy and all you need to do is follow these simple steps! Select a terracotta clay rectangle planter or one made of poly resin that has a terracotta color to it. The garden pot shown is 30" long. 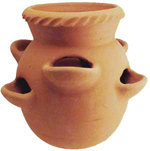 We offer a number of terracotta planters and poly resin that would work. Fill the window box with compost, mixing in 2 teaspoons of plant food or fertilizer. Plant the gazanias on either side of the center. 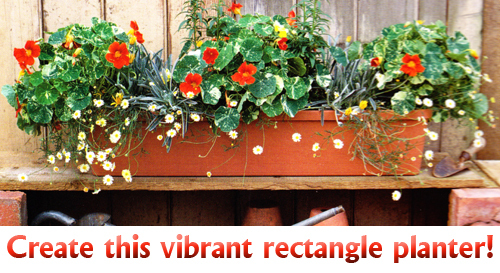 Plant the nasturtiums at each end of the terracotta container and in the center of the pot. 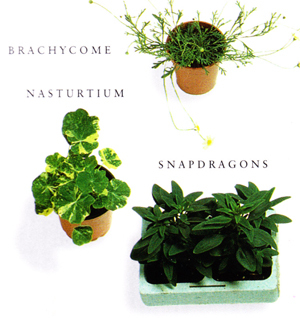 Plant the three brachycome plants, evenly spaced, along the front of the container and then plant the two snapdragons on either side of the central nasturtium. Water the whole container thoroughly and stand in a sunny position. The leaves of the Alaska nasturtium look as if they have been spattered with cream paint. In this flower box they are planted with yellow flowered snapdragons, gazanias and branchycomes daisies. Stunning! Nasturtiums are among the easiest plants to grow from seed. Start them off about 6 weeks before you plant the window box planter, potting them on to keep them growing vigorously. Plant this container in Spring. Veggies & Fruits together potted. Combining veggies and flowers is a creative way to enhance certain plants to each other visually and culturally. It also is convenient since it doesn't take scientific talent to achieve. Experiment with what you like and find out what works. We have a few tips to help when choosing which items to pot together but you need to try things that you like and see what you can grow successfully. Harvesting these combinations is fun and interesting but you can also plant combinations for decoration. Dried pods work great with beautiful floral wreaths or table arrangements. Use dried sunflower heads in arrangements of colorful vegetables and flowers. Select colorful planters that compliment the combinations or go with traditional terracotta clay for the earth loving feel. As always, the main idea is to have fun being creative and use combinations you like. Marigolds with tomatoes: Strong scented marigolds repel insects and help tomatoes grow more productively. Grown beneath tomatoes, marigolds also suppress weeds from growing out the top of your planter. Morning glories attract hoverflies, which feed on aphids, thus keeping the pests away from corn. Plant is colorful containers that accent the red of the tomato or the gold of the marigolds. Nice! Nasturtiums repel squash bugs and other insects that attack cabbage, cucumbers and squash. Members of the chive, garlic and onion family protect their companions from insects and deter rabbits from eating the flowers. It's that time again to talk about strawberries in garden planters. Growing berries in containers can be a great alternative for those with little garden space and those who want to keep the plants from taking over the yard. The root systems on most berries are very hardy and love to take off and take over. 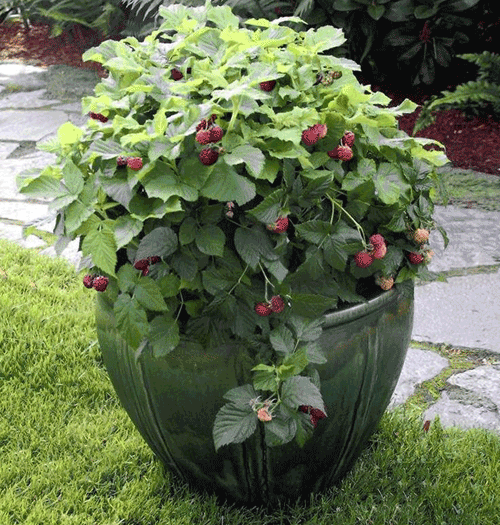 The key to a successful berry container is good drainage and large enough pot size that will accommodate plant growth. While plants will vary with soil type, the basic planting is the same for berries growing in a planter versus planted directly into the soil. Fill the container about half full of planting soil mix. Loosen the starts roots from the nursery container and place the plant in the pot leaving about 2" around the roots balls of each individual plant. Make sure it comes near the top of the pot and is not buried. The, fill the pot with remaining soil. When completely filled, water thoroughly and gently. 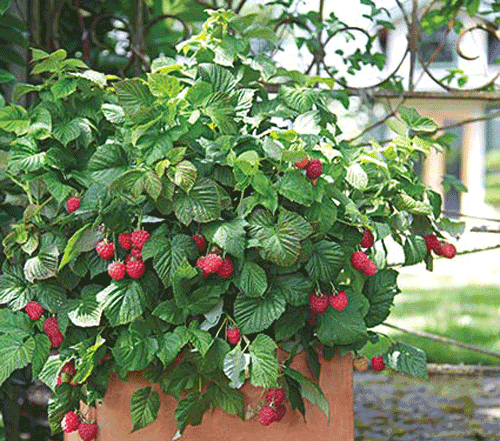 Caring for the berries in a planter pot or strawberry jar is easy. Plant in early spring while still dormant and place in the sun. The pots need plenty of water each week and deepening on amount of wind is blowing. Wind tends to dry out garden planters faster. Fertilize monthly with a product that is made for berries and follow instructions carefully. Lightly prune each year and always during dormancy. Remove the old dead branches and anything that may look diseased. Protect the plants with a layer of mulch in winter and they should survive. You can always move the planter pot to a garage or greenhouse. There are 2 main types of berries. June-bearing and ever-bearing, that obviously bloom and fruit at different times. June-bearing begins blooming in early spring and as the days get longer, flowering decreases and the plants top bearing fruit. flowering in ever-bearing strawberries can produce fruit over a long period of time. In cooler climates this means a consistent crop of fruit. Flavor and sweetness depend on the actual variety you choose so discuss this with a person at your favorite nursery. We thought this project looked like toooo much fun not to share it with you. Gather and old laundry hamper, scissors, soil, fertilizer and plants. Start by filling the hamper with 6" of soil. Use a potting mix not the soil from your yard or garden. If necessary use scissors to cut or expand holes in the side of the hamper for planting. 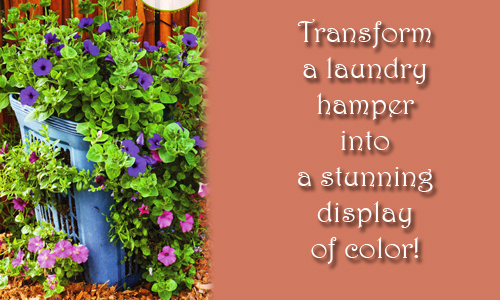 Gently position plants on their sides and pull the foliage forward through the hole in the hamper. Sprinkle in some slow release fertilizer and cover with another six inches of soil. Repeat above stops until hamper is full, capping it off with a crown of plants on the top. How easy and cute is this project! To ensure that all sides get some direct sunlight place the hamper on a lazy suzan. This makes pinning it around a breeze. Read more.....Art in the garden. 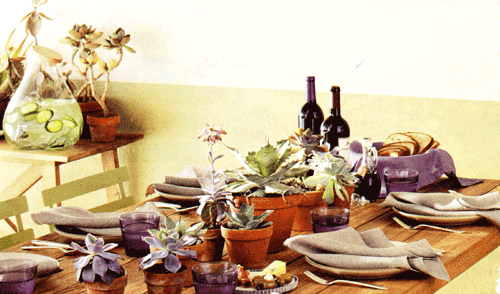 It's time to spruce up your outdoor dining spaces with planted pottery as centerpieces. It's easy and fun to do. We offer a few suggestions here to help out and get your creative juices flowing! The best place to start is by asking yourself a simple questions. How long will I be using this container and need for it to look good? If you want it to look it's best for a few weeks then you need to consider the type of plant materials your are going to use in the potted arrangement. If your masterpiece needs to be a show stopper for a single event or for just a few days then almost any plant materials will work. You may as well go for something outstanding for that one event. 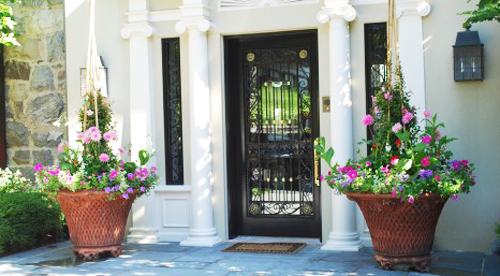 When choosing plants for these decorative containers, consider the water they will need, the type of container size and style they will do best in and how much sunlight they will require. Try to put the same types of plants together so that their needs are similar and taking care of them is easier. Now is the fun time to select the container. Try to protect your table surface with a saucer, pot feet or a piece of cork. 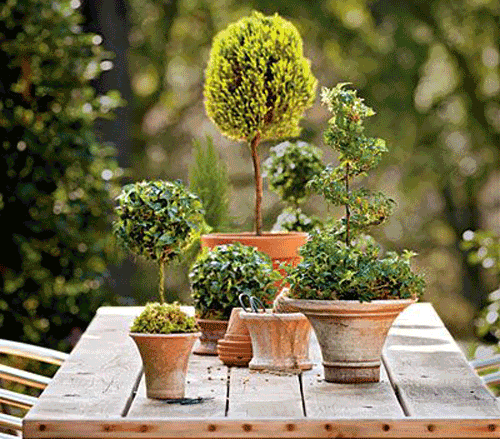 Use a decorative and colorful container when working with evergreens and one color plants. 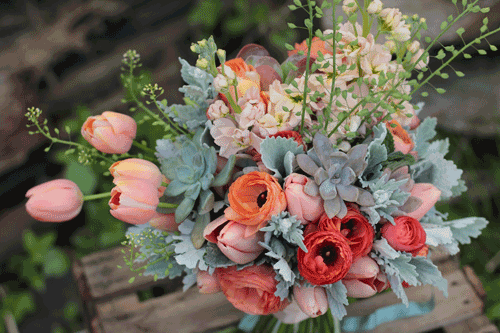 When you are using a colorful bouquet of flowers then you can go with a plain container or terracotta color. The plants and flowers don't need the added help of a bright container. We like to use a piece of plastic wrap to line the interior of any container to help with water condensation. Also consider the root system on the flowers or plants your using when deciding how deep the planter needs to be. The main point to consider is how long you want it to last when making the decision on the arrangement. 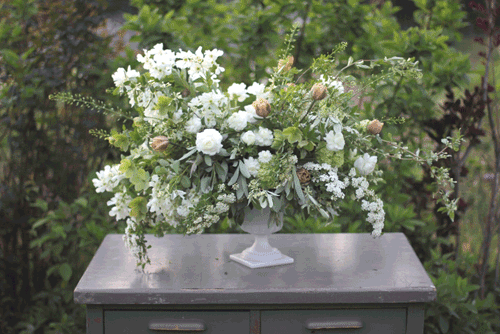 Then let the container take the lead when it comes to how flashy to make the arrangement. Lastly, cover the soil so your guests aren't looking at soil while enjoying a meal. Use faux rocks that well sell in the pot accessory section. Pot Shards, colorful glass marbles are both wonderful and inexpensive. We like to see tabletop planters decorated with flower picks, small children's toys, colorful ribbons, feathers or fruit. The main idea is to have fun and get creative. Read more.....Starting plants from seeds saves money. 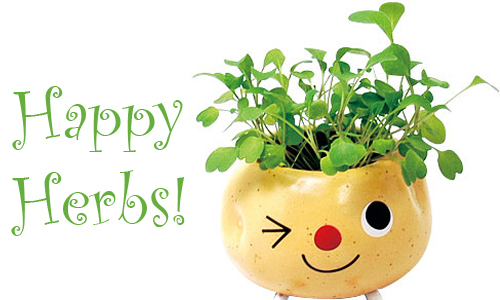 Keeping potted herbs happy and healthy is very easy to do. They like a minimum of 5 hours of direct sunlight every day. 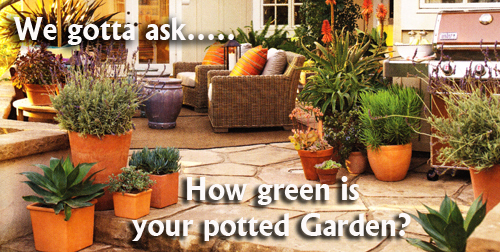 Keep pots soil moist and well drained. 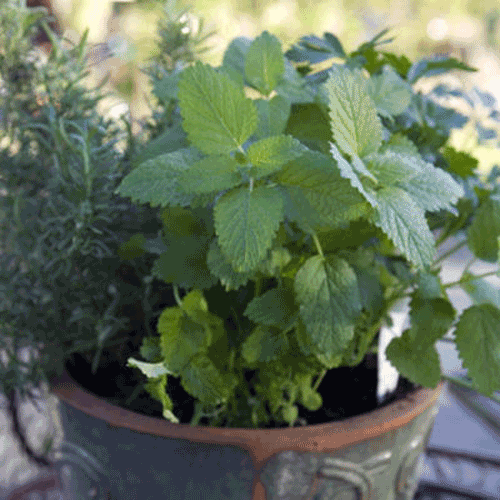 Remember, herbs grown in garden pots dry out quickly, so consider using containers at least 12" across. 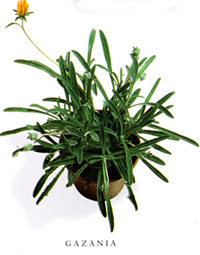 Plant with a timed release, granular fertilizer in mid summer, or use a water soluble liquid. 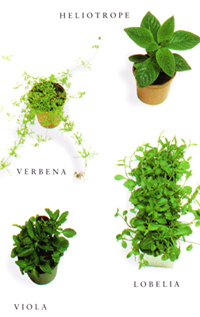 Trim herbs frequently to prevent them from flowering. When they do bloom, their flavor diminishes and growth of tasty new foliage slow. Chives: With clumps of grass like leaves, chives are valued for their mild flavor and rosy purple flowers in spring. They are especially easy to grow in potted planters because they tend to spread their roots and take over your garden when not contained. Scatter seeds in a well draining pot with good potting soil. Make sure the pot is placed in a sunny kitchen window or on a sunny patio area. Garlic chives also called Chinese chives, have a mild garlic taste which is very popular. They have flat leaves and white flowers. They self seed so profusely that the only maintenance they require is cutting back to make sure they don't overtake the whole pot. Rosemary: One of the easiest and most fragrant herb to grow, they require only plenty of sun and well draining potting soil. This plant grows bushy so select a good sized garden planter. It has greenish gray needle like foliage and blooms in winter. They vary in height from 1 to 6 feet so make sure you get the correct seeds to fit your pot. You can also clip them into topiares. We love Rosemary in cooking. Stuff branches inside a chicken to roast, fill a vase with them and place on a kitchen counter for fragrance or use them in flower arrangements to add green foliage and smell. Yummy! Thyme, is one of the most beloved perennial herbs in any garden. The aroma is warm and exotic and the foliage is finely textured. While some selections of potted thyme are essential in the kitchen, others are among the most appealing herbs for landscaping and patio decorating. No matter what the season, thyme puts on a show. It's evergreen foliage provides interest in the garden and is wonderful in any vase arrangement. In early spring the flowers open, sprinkling the plant with spots of white, pink, lavender, or rose. Sage: is a small, mounding shrub 8 to 36" wide so make sure your garden planter is large enough. Its velvety, gray green leaves are essential to flavoring many poultry and holiday recipes. Try it in cooking and you will love it as much as we do. Many colorful varieties exist. 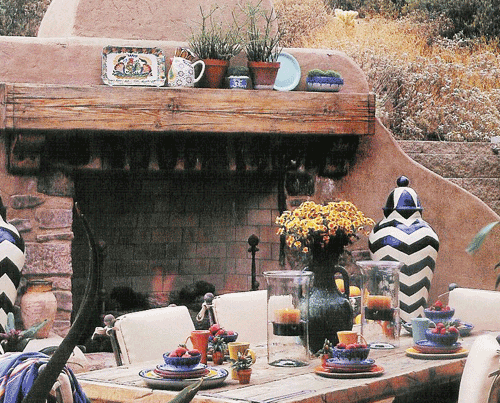 Golden sage compliments terracotta pots and purple sage is great in bright glazed pottery. 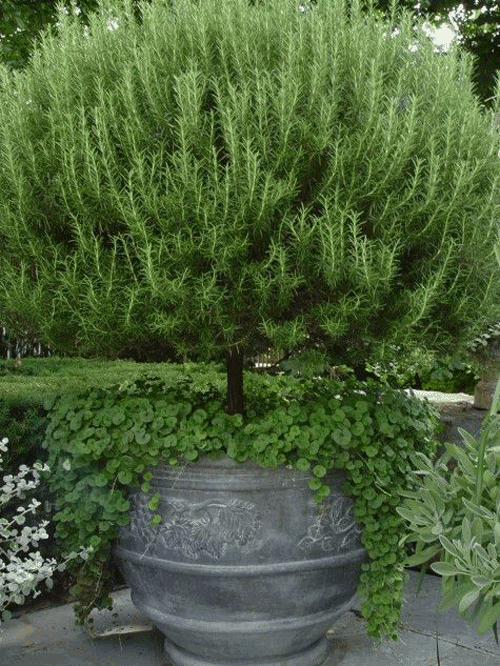 The darker foliage blends well with rosemary, lavender and purple basil varieties. The most popular herb that is grown in garden planters is basil. From seeds it really easy and hardy and will save you money over store purchased. Especially if you are a pesto fanatic. Wait till mid May when the soil warms up in your pots to scatter the seeds. Press them into the soil with your fingers and then gently water. This plant is hardy and easy to transplant into other pots. 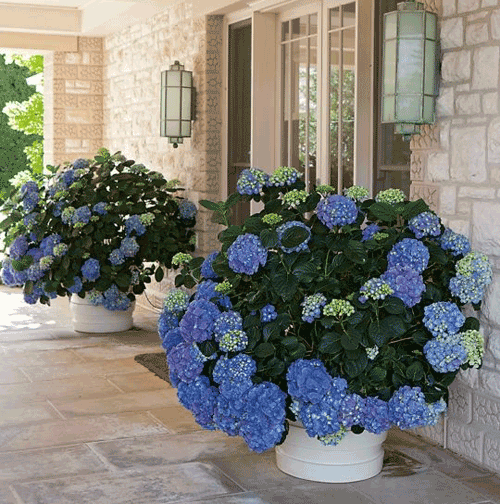 Read more.....Hydrangeas are in bloom. Read more....Stop animals from nibbling. 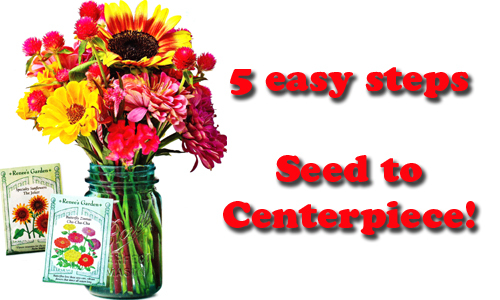 5 steps - Seed to Centerpiece! Listed below are the 5 easy steps to take you from a seed packet purchased at your local nursery to a lovely table centerpiece! 1. Shop your local garden center for seeds. You will find a wide assortment of fast growing annuals in a rainbow of colors. If you prefer to shop online there are tons of websites that you can find that ship seeds packets directly to you. Try to select colors and fragrances that you hope to enjoy and will fit into your decorating designs. 2. 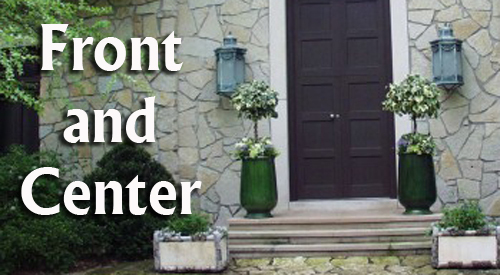 Prep your flower pots or beds. Pick a sunny spot (at least 6 hrs daily) with well draining soil. Work in organic matter, rake smooth, and water to moisten the soil. Having ground to grow cutting flowers is not always possible. You can easily grown them in garden containers. Simply follow the same instructions listed above but make sure the planter you use is deep enough and wide enough to hold the amount of seeds you hope to sow. 3. Sow the seeds. Follow the planting instructions on the back of the seed packets. Cover lightly with soil. In as little as five days, many sees will sprout. Once you see two leaves, thin to ensure correct spacing for future growth. 4. Harvest Early. Flowers are freshest in the morning. Use a sharp pair of scissors or snips, cut stems a little longer than you will need for the arranging, and place them in a bucket of water. To encourage more blooms, cut flowers regularly - especially zinnias. Measure the vase or pot that you will be arranging the flowers inside of in advance. Make sure that you cut enough length in advance. 5. Assemble flowers, and your container. Recut stems at an angle right before arranging. If you change water daily, you don't need flower preservatives. These cherry blooms are easy to grow, require minimal care once established, and yield plenty of flowers for cutting. They also like garden planters as well as the ground. Give it a go and let us know how it works for you! Read more.....Keep cut flowers fresh! May, Now What In The Garden? Now that the Month of May is upon us, are you wondering what needs to be done in the yard or garden? We have a few suggestions! By now you should have at least one potted cacti around your home or garden area. 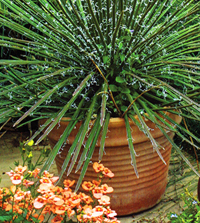 We love the agave because they are easy to grow in garden pots, they fit into traditional and contemporary landscape designs and they are easy to grow. This may you should get a long handled saw and some heavy gloves, remove dried leaves from around the bottom of the plant and use the saw to prune back any growth not wanted. Basically just clean them up. This prepares them for upcoming growth spurts! 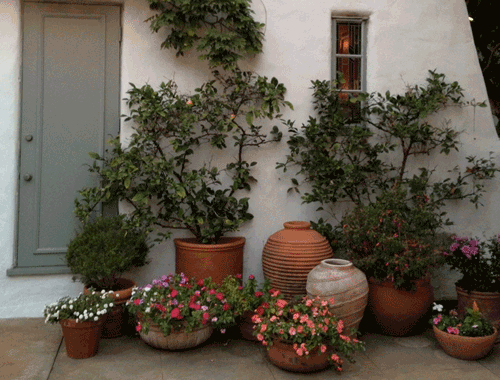 It's that time again to refreshen up all your garden pots. 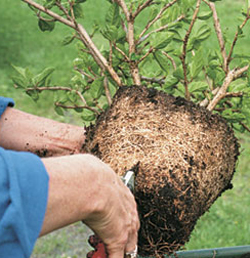 Ease overgrown plants out of their containers and root prune them. Then replant them in the same vessels filled with fresh potting mix. Or better yet, move them to new larger containers and use new soil mix. This is the time of year to transport healthy plants to new homes. Every thought about trying a strawberry plant. We'll we have the strawberry pot that works perfect. Made of real terracotta clay they come in 6 pocket, 9 pocket and 12 pocket pots. 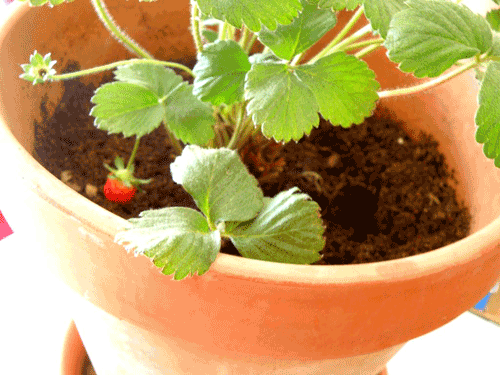 Place a strawberry starter plant in each pocket. 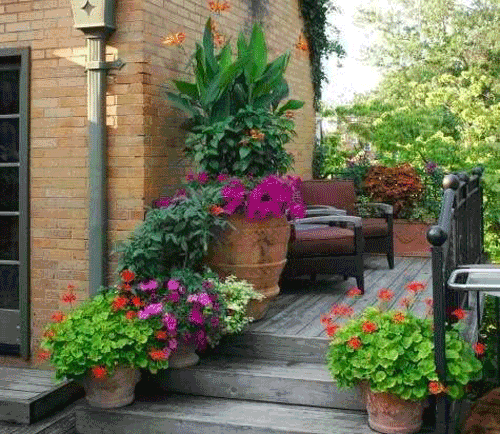 These pots contain the plants wondering roots and keeps them from getting out of control and taking over your garden. 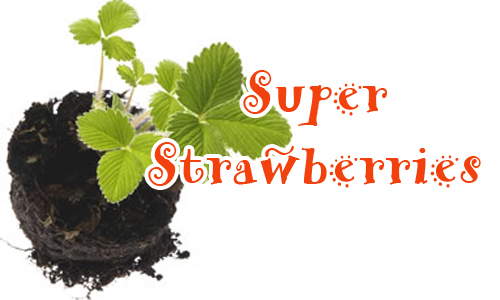 Alpine strawberry plants are available now and they are super flavorful. They produce fruit from Spring to Fall. Lastly, this is the time to sow seasonal color from seeds. Or if you are into transplants from the local nursery now is the time to purchase them and pot them for color on your patio or in your garden area. 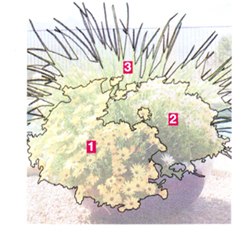 Flowers like ageratum, coreopsis and gaillardis are beautiful and easy to grow in garden planters. And, don't forget, to feed potted citrus trees with a citrus fertilizer to promote good fruit development now. We love these potted also! Read more.....Planting a container is easy!